David Chernaik has made something of a corner for himself by exploring Portuguese composers unknown in this country and his discovery of 'Portugal's leading 18th-century composer' João de Sousa Cavalho's opera L'amore industrioso was one of the successes of the Opera Holland Park season in 2000. Now he has turned his hand to the modinhas, Portuguese love songs from the salons of Portuguese/Brazilian society in the late eighteenth and early nineteenth century. They were vastly popular, with hundreds published and circulated in Lisbon's Jornal de Modhinas. Intended originally to be sung with guitar or piano, but sometimes played by groups of musicians, the printed accompaniments are very simple, so Chernaik has arranged them tastefully for string quintet with occasionally a flute obbligato. This gives a flavour of café music or even suggests an accordion sound. Described by the novelist William Beckford as 'the most voluptuous and bewitching music since the days of the Sybarites', they are indeed charming and seductive, and prove a perfect vehicle for Lorna Anderson's debut CD for London Independent Records. She has a natural manner of singing and holds interest through the repeated phrases in the numerous stanzas. All seventeen tracks should however not be played straight through, because their variety is limited and the moods conveyed by the music often belie the anguish of the forsaken lovers. English summaries are supplied, but you would do much better to follow them with the complete bi-lingual texts which can be accessed and printed out from the London Independent Records website (www.london-independent.co.uk) – an excellent solution to the problem how to provide texts and translations whilst keeping production costs within bounds. The recording and production are exemplary, and the venture was supported by the Calouste Gulbenkian Foundation. 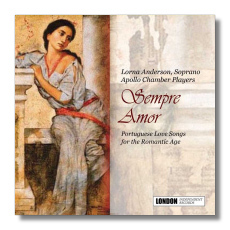 Portuguese love songs from the salons of Portuguese/Brazilian society, vastly popular in the late eighteenth and early nineteenth century – charming and seductive, and a perfect vehicle for Lorna Anderson's debut CD – complete bi-lingual texts can be accessed and printed out.